The mix, in both type and rate, of taxes a state chooses to employ has been associated with economic growth. Further, within states, many functions and their associated taxes may be shifted between state and local government “layers”. This makes it difficult to accurately estimate the impact of taxes on statewide economic performance, as tax rates may vary between regions within the same state as well as between states, but we have selected six tax metrics that have a high degree of similarity between states and encompass a large proportion of most state revenue collections. We include in the “Taxes” category the following six measures: highest marginal corporate income tax rate, highest marginal individual income tax rate, local tax collections per capita, sales tax rate, gasoline tax rate, and property taxes as a percent of home value. Taken together, these taxes provide a view of the major revenue devices employed in most states. Most notably, Pennsylvania continues to have one of the highest corporate income tax rates, with a rate of 9.99% (compared to the median of 6.5%) and a ranking of 49th among the states. On the bright side, the commonwealth’s individual income tax rate, at 3.07% compared to the median rate of 5.33%, gives Pennsylvania a ranking of 11th. The commonwealth was ranked 8th as recently as 2015. The change in rank to 11th is due to personal income tax cuts elsewhere rather than an increase in Pennsylvania’s tax rate. Pennsylvania’s flat rate of 3.07% is still significantly lower than the median rate of 5.33%. However, it is worth noting that the median rate decreased from 5.75% in 2014-2016 to 5.33 in 2019. Local tax collections per capita and the sales tax rate are ranked in the middle, at 31st for local tax collections per capita and 26th for the sales tax rate. 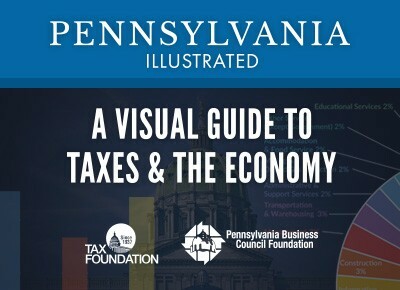 It should be noted that Pennsylvania’s sales tax rate of 6%, which is virtually identical to the national median of 5.98%, includes exemptions for most food and clothing, which is not true of all the other states. The state gasoline tax rate is considerably higher than the median, ranking 50th with a tax of 57.60 cents in 2019, compared to a median of 25.02 cents. Pennsylvania’s property taxes as a percent of home value are higher than those in most states, with a rate of 1.57% in Pennsylvania, compared to a median of .92%, and a ranking of 40th.